Excellently researched and well written article Mr. Enriquez. I’ll be sure to pass the article to my American-born children so that they are aware of their history and the greatness and “resilience” of their descendants. Thank you! Never too late Bro Jerry but just read the article. Thanks for the insight. I read with mixed thoughts because our history comes with different views over the years. If I had the funds and time I will live in St. Vincent and visit the archives of the caribbean to find the stories about the journeys of the different groups. I wish you would include some references so that we can also journey through the eyes of those writers. I must agree with you that our value systems have changed and yes, we have a different journey with different challenges but our unified journey must be about cultural survival. We need to pool our resources together and focus on the goal. We must teach our children the correct history and let them be challenged to find out more for themselves too. They are disconnected because of many reasons but we must see how best to assist. I would not say that there is a subtle downplay of our African Ancestry because we embrace all. I think what is challenged is the idea of making us more African than the African. Some Garinagu I know what embrace only the African heritage but I told them that we are a combination. A wonderful combination that has produced a people with different many things and that must be cherished. We are not one of our heritage we are a combination. Thanks also for sharing your insights Gwen. Indeed one cannot capture the complexity of history within the snapshot that was presented. As for references, the article mentioned Nancie Gonzalez’s book, Sojourners of the Caribbean. It is a well-researched resource. My writing is also informed by the courses I took Caribbean history while I attended graduate school at UWI (1991-93). I am deeply indebted to one of my professors, Sir Hilary Beckles (who now serves as Pro-Vice Chancellor at UWI and heads the reparations movement) for my deep appreciation of Caribbean history. Discussions with colleagues from the Caribbean region also enriched this appreciation and connection. Having studied both in the US and the Caribbean, I would strongly encourage Belizeans to deepen their connections with the Caribbean region. Like you I continue to have an interest in finding ways to reconnect to those roots and to share our experiences especially given the common roots that Belizeans – Garifuna and Creole – have in the region. I am concerned that the erosion of that connection as more people turn their emphasis to North America will continue to weaken the awareness of our common history and the vital connections needed in the region. Aban isieni. Gwen, that was not meant to be “Anonymous”. It’s my response to you. This piece is superbly written and I couldn’t agree with you more Mr. Jeremy Enriquez. 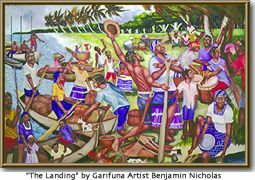 Our Garifuna people survived many hardships on their way to the coast of Belize and then upon their arrival. It was their resilience as you pointed out, and their ability to look out for each other and protect the common good that allowed them to survive and thrive. These are the lessons that our young Garifunas everywhere regardless where they live, be in Belize, Honduras, Guatemala, the USA or elsewhere. With the emergence of social media, i.e. Facebook our people must use whatever technology available to remain connected and to network in order to confront the challenges that face us. The folks at Facebook Education http://www.facebookeducation.net (please like us on Facebook) are very proud of your work and applaud your efforts to rally our people to hearken to the lessons of our ancestors. Never have I felt such a sense of belonging! Each line drew me in just the way live drums force once waist to move to the rhythm! By the end of this beautiful piece my face was socked with tears, it’s been along time since my emotion got the best of me, as a people as a culture we have come to far to give it up now! Through my entire years of formal education I was told this ” either no one cared or no one knew ” the only way we can keep out history in the Caribbean alive is for it to b apart of the education curriculum, but more importantly get passionate ppl to present it! Jerry I always admired and respected you after doing this piece a adore you thanks a lot and may god continue to bless you! We definitely need to have a sit down when I’m home again!!!! Thank you Frank and Milton for your insights and compliments. Yes, we must keep sharing our history as well as the history of other marginalized peoples, including indigenous and Afro-descendant groups. Interestingly also is the observation that there is hardly any discussion about the nature of slavery in the early settlement of Belize, perhaps to deliberately erase this from the collective psyche. History affects the present and with the understanding of history one can re-direct the course of the present so its impact does not continue to shackle us. Let’s keep the discussion going.